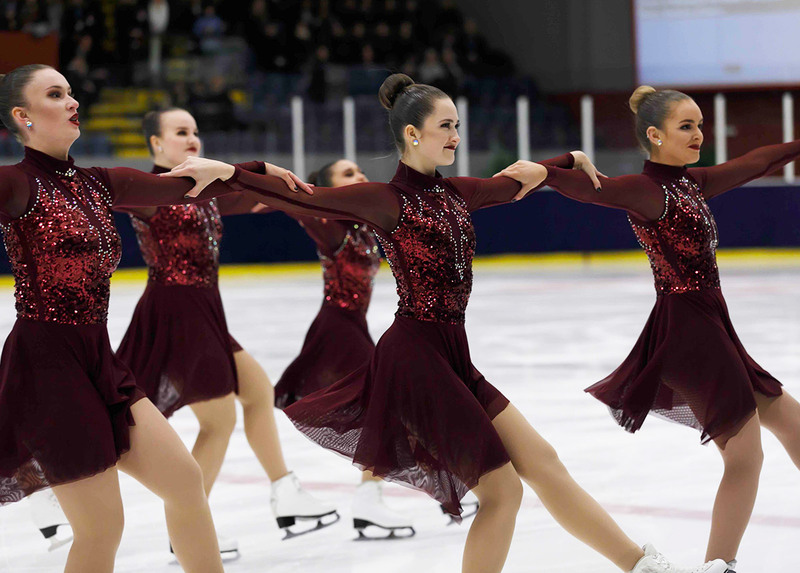 It took Katrina many months to speak about her experience with Team Viola, a fully funded Senior ISU Synchro team from Great Britain. Jura Synchro gives her the opportunity to come back on this crazy season. First of all Katrina, what is your synchro background? Katrina Cotterrall: I Joined a Precision Skating Team in Queens London called the Queens Coronets, skated with them for 3 years and that is where my passion for Synchronized ice skating began. That and my complete obsession for NEXXICE. I am not ashamed to admit that I am a complete stalker, in fact, I am in Italy now at The Spring cup to watch them. In 2007 I commenced a Midwifery Degree, due to having 3 children and a busy family life I regrettably had to reduce my singles coaching hours. Within 3 weeks of doing so I missed My skaters, to enable us to keep in touch I started a Synchro Club where they could all keep in touch, remain skating and here I am today. My first Ever synchro team were called Team Spirit. We started training in Bristol for just 2 hours a week. 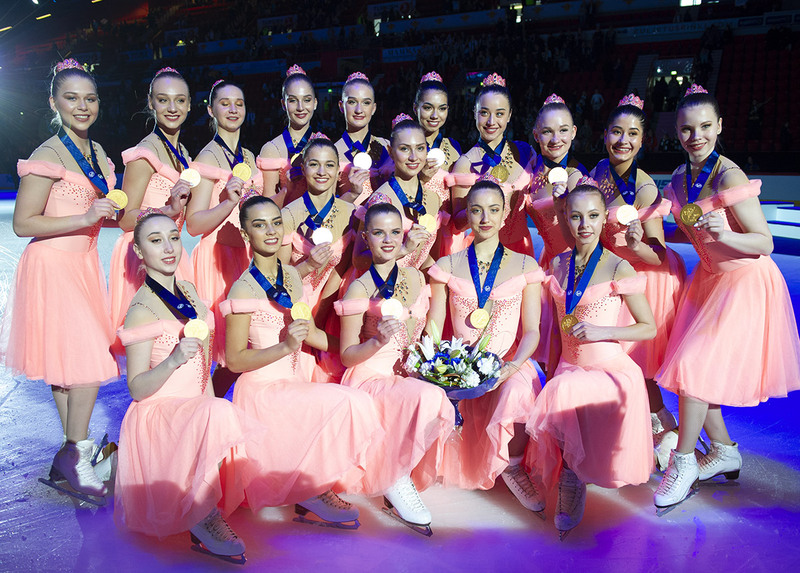 That team was so much fun, just a bunch of skaters who had retired from solo competition and found a new passion for skating in synchro. We learned together, traveled together and grew together. 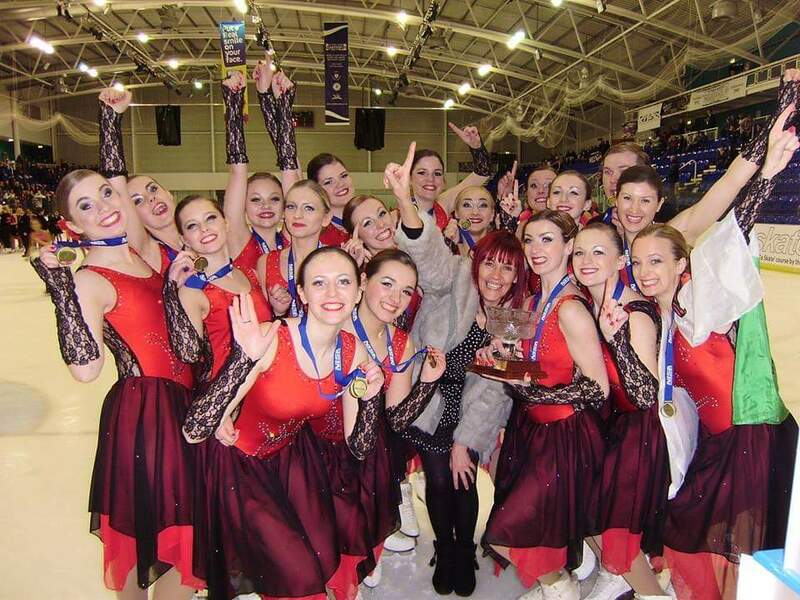 In 2013 we competed in our first Senior ISU event held in Zagreb, The Snowflakes trophy. Being in that competitive environment, around such high level teams heightened my passion for the sport even further. It also highlighted to me the need for further help and expertise for my team, if we were to succeed any further. So you wanted to improve as a coach? Yes. Following this competition in 2013, I contacted Alain-Daniel Hostache, head coach of Team France Zoulous. I asked if he would come to Britain to work with myself and skaters, that summer along with 2 of his skaters he came to Cardiff and completely changed my way of coaching. It was immense, his energy, positivity, and motivation shone through, and the skaters were left with a desire to succeed that they never had before. I honestly think if I had not made that Jump and asked for help, the team would not have had the success they had. Alain and I remain very good friends and he is a fantastic Mentor for me. We went on to qualify for Worlds 2014 in Courmayeur as Team GB. That week in Italy will stay with me forever, it’s definitely a hard week to beat in terms of memories. Team Spirit had a successful few years, they were again Team GB at Worlds 2015 in Canada and continued to compete internationally for the next 2 years. Our club grew from strength to strength over that time. We had 4-5 Teams, all having great Success. Team Destiny were the 2017 British Champions in the Junior B category, their program remains one of my favourites to date. How was the beginning of Team Viola? In January 2017 the day after the British Championships the CEO of Viola contacted me with a proposal of heading up a fully funded Senior ISU Synchro team. His daughter was already a member of Team Spirit and he wanted to invest in the team to allow the skaters to train without the financial strain. It took me approximately 5 minutes to say yes. What coach wouldn't. Following meetings with Myself, Committee and Viola an action plan was put in place, and in February 2017 the search for suitable skaters commenced. Then, you looked for qualified skaters! Yes! We had a 2-day audition process in March, the skaters were put through many tests. Skills, Drama, Ballet, Strength and Conditioning and an interview and it was the first draft of the team were selected. I loved those 2 days, it really felt like something special was going to happen. We had a great team of coaches working with us, it just felt special. The first 3 months were spent training skills, it is what I love doing the most. We skated in darkness, soft music and literally took it back to basics. Forward stroking, edges, runs, the flexibility it was great to be able to have the ice time, and the hours to be able to do this with them. Off ice training was just as arduous. Our Personal Trainer Rhodri Williams laid out an amazing Strength and Conditioning program for the team, all individualised and synchro specific. Samantha Amelia Hancock, our Ballet teacher worked with them on core, flexibility, and posture, it really showed. We were a fantastic group of coaches, I really felt we worked well together, I miss those days. In the early summer we brought over Kristen Loritz and Lee Chandler 2015 World Champions to Choreograph Team Violas Free program for the season. Having worked with Kristen since 2015 I knew she was the right fit for the Team however, to see her and Lee work together....... WOW, To say I sat and watched in awe would be an understatement. They brought something to the team that I could only dream of bringing. It was 50 hours of sheer enjoyment, growth and sore muscles. In the late summer, we had our summer camp in France with Alain-Daniel Hostache. We spent 7 intense days Choreographing the short program, training on the beach, training skills, bonding as a team, learning about each other, another bunch of memories for the book. We then had our well deserved break. We returned to training Late August and unfortunately did not have a full team, skaters left due to logistics, struggles with the training schedule, commitment. With the help of ONETEAM, we were able to recruit international skaters so Team Viola could continue their Journey. Why did Team Viola end last summer? In short, there is no clear answer, it was a shock for sure. The day we were told it was to be no more it was due to lack of funding. To fund a team of that level, a team that required that much training does not come cheap. I can only say that I am 100% grateful to have even had just 1 year of being able to coach at that level, it reaffirmed that it is the only way synchro teams can improve their scores year after year. We had so much success in such a short space of time, 10 months. I can confidently say it was down to the hours of training, on and off ice and the structure. All of which were funded by Viola. I am sure there is not one Violie (nickname given to the skaters of the Viola team) who didn't appreciate or learn from the experience, and wherever they are I hope they are using that period of training to better themselves, enjoy what they have left of their synchro years. I was heart broken, no easy way of explaining the emotions around that time. It hurt for many reasons, for what we had achieved and for what we could have achieved if we had stayed together. The team grew from strength to strength following their first worlds Debut. We had tryouts for the new season before we left for worlds and on our return had a strong team of 18/19. I’d never had that before, it was so exciting. Lee and Kristen returned in May and choreographed the free, we were so ready. The team were already another level both in terms of skill and performance. Did you like being the Team Viola coach? I LOVED coaching Viola, it did not come without stress, no job does however, I had a fantastic bunch of coaches with me, internally and externally, the majority of the team were like sponges and soaked up the environment, relishing in the structure of the training. I have a Masters in Sports and Performance Coaching, my dissertation topic was "Creating an athletes centred environment for synchronized ice skaters" . Having this time with Viola allowed me to utilise what I learnt from my Masters and change my coaching style when needed to benefit the team. Today, after almost a year, what is your best memory? So so many. Maybe the moment we shared before they left the changing room to compete their short at Nationals. Previously I found it so hard to talk at comps, letting my own nerves take over, rendering myself useless to the team at that point but Id been rehearsing what I was going to say to them for weeks. It was a big moment for us all, so. much expectation on us at that comp. We felt we had so much to prove. I prepared a speech that went out the window due to emotions so I just spoke from the heart. I won't divulge the whole talk but their was a moment where I said "By being who you all are, by turning up to training week after week, following my direction and crazy ideas we have become this. You have allowed me to bring out the best in you, and in turn, you have brought out the best in me. I am me because of you and for that, I am so very grateful" It was special, it was a moment, there were tears for sure. I have new teams now, Magenta. It is not easy starting over again however, the sport is so hard to walk away from. I Love it. This season has been a hard one, to say the least, My Seniors have yet to compete fully at an event for varying reasons. It makes me sad after so many struggles but more so their programs are just beautiful. We will keep the programs as they have not been skated. What my experience with Team Viola taught me the most is how I need to keep training teams with the same amount of intensity. It's hard to revert back to 2 hours a week when you have had a taste of what more ice time and longer off ice training can bring. My Senior team is made up of traveling skaters as always, which makes it logistically difficult. However, we still train 20-25 hours a Month on ice. The benefits far outway the sore muscles. My hope is that we can build on what we have started and be ready and strong to debut The Team Next Season. My Juvenile and Preliminary team are also embarking on a new training structure for the first time. We have incorporated Ballet, off ice classes and increased our on ice training hours. It has always been my dream to start at grass roots level, by introducing the young to longer training sessions. To be able to start this at such a young age, will make the transition to Junior/Senior level far easier. I'm just lucky to have a super bunch of parents behind me who fully support their children doing this and are completely smitten with synchro. Finally, what are your dreams for synchro? Obviously, the main goal is to get this beautiful sport into The Olympics. I have to believe that when the time is right it will happen. My dream, till that happens, is that lower level teams have the opportunity to train as the top level teams do. It will allow us all to be on the same playing field. It’s a big step for sure, but starting with little steps make the big steps less scary. My advice to any skater/coach embarking on a career in synchro. Have an open mind, be prepared for all the emotions that unveil, especially when you least expect them. Work hard, enjoy working hard and take the rough with the smooth. This sport teaches individuals so much more than how to skate, it taught me how to live.